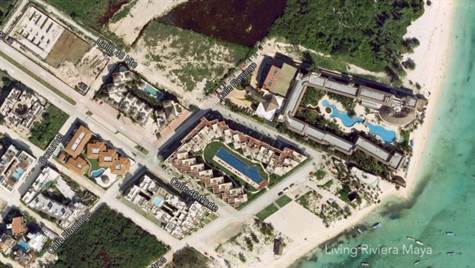 Land for sale on 48th street across from beach, behind the Elements condos on the north end of Playa del Carmen. If you want to invest in a great location where Playa del Carmen is growing, this is the place to buy in Playa del Carrmen. This lot for sale is 150 meters to the turquoise blue Caribbean ocean and white sandy beaches. In a great area of playa del Carmen Real Estate, an area called Coco Beach, away from the crowds but close enough to walk everywhere. Across from Elements condos + Coco Reef Hotel. A sought after area, high end projects have ben know to be built here. Very close to 38th, the Shangri-La Street where you can dine at La Cueva del Chango and many more restaurants. This lot for sale is 2451 square meters (26382.3 square feet). Un terreno en venta ubicado en la calle Cozumel con calle 48, tiene 2,451 metros 2 y esta a 150 metros del Caribe!